Yup. That’s me. A Bat out of Hell in our scorching new minivan. Adios, carefree youth. We had one hell of a ride, didn’t we? I had an alternate silly song title for this post. It was almost called I Can’t Drive 55, because the truth is, I’m not sure that the van can reach such top end speeds. We’ve had it for a few weeks now, squiring our four-month-old son around city side streets like a regal king in a sad little chariot, and I haven't had enough open road to take this beast of a vehicle up to even 40 MPH. Our trips ate a constant circuit of stop signs, traffic circles, and school zones. Though I openly joke that the chariot's zero-to-sixty time is seven hours, deep down I know that it could probably hit higher speeds if given the space. And most importantly, a cool name. No joke, we had an easier time naming our son. Let’s just send a shout-out to the Toyota Marketing Team. Nice work. We bought your Swagger Wagon. 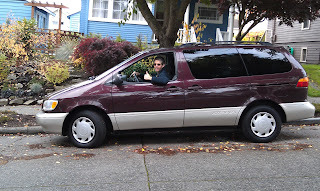 And for sure, I'm all jacked up to trick out the minivan and have the coolest ride in Seattle's westside. Or at least the northeast quadrant of the westside. Oh yeah, once I figure out what "tricking out" actually is, I'm all over it! To be honest, I probably stopped being cool behind the wheel on the very day I bought a teal Toyota Paseo back in 1993. But even if there was a hint of hip to my Paseo back when I first bought it, I definitely abandoned cool when I rode this very same car right on into the 21st century. And given that I'm still driving this relic of an auto, it's conceivable that time behind the wheel of a minivan might actually elevate my cool quotient. However, with a Blue Book value that’s less than my laptop and gas mileage that’s still above 30MPG, this little toy car has become the untradeable engine that could. My kid will probably laugh at this little teal monster once he’s old enough to consciously do so. But I'll get the last laugh, because in sixteen years, it will probably become his first car. Of course by that point, it will be the last Paseo on the planet, and will be classified as Vintage Cool. I imagine we've all tried to be cool at one point along the timeline, though we were likely too cool to admit that we were actually trying. For me, it started in the seventh grade, when I hit three balloons with as many darts at a local fair, and won a three-quarter sleeve Van Halen shirt. I must've worn that shirt five days a week. The other two days, I alternated between the Rush and Cheap Trick shirts that I won later in the day. Those balloons, they were pretty big that day. From that point on, manufactured cool continued to plague me over the years, and it wore many ridiculous costumes. OP t-shirts and Vuarnet shades. Leather bomber jackets and skintight jeans. Docksiders without socks in snowy, sub-zero weather. Tie-dyes, goatees, flannel, Birkenstocks, earrings, long hair, short hair - and so goes this calamitous list of affectations I adopted just so I could project the image and attitude of the person I hoped I was. All along, of course, this person was constantly changing - sometimes evolving, sometimes regressing, but always in flux. Such is the oft insecure urgency of youth. Now that I'm (*cough*) slightly (*cough*) older, I wonder if cool is not caring about whether or not you're cool. I hope so, because nowadays I go a week without shaving, have no idea if what I'm wearing is clean, and oh, did I mention that I drive a minivan? Then I remember why I'm driving a minivan. It's because we need space for our super cool baby boy - the apple of my eye, my very best bud, and the Atwell household's top dog. If ultimately we need even more space, I won't care if I'm out there cruising the streets in a used UPS truck, or a hollowed out school bus. I've heard some say that you stop being cool the moment you become a parent. Seems to me that this is actually a good time to start being cool. A time to reallocate the energy I've routinely spent on myself. A time to skip the daily shower because the little one is having a tough day and needs attention. And finally, a time to paint the minivan like it's the second coming of the Partridge Family bus. My wife won't mind this last project, right? So for now, we roll in a burgundy minivan, and I feel pretty damn good about it. Given my tendency to drive a vehicle long past its junkyard point, I'm sure I'll have a follow up minivan post at some point down the road. In fact, I think I already have a title for this post. Life in the Carpool Lane.